Nearly fifty Spartans were racing in open events at the weekend and a lot more were doing parkruns. Thirty two (32) Fairlands Valley Spartans ran the St Neots Half Marathon. After the mist lifted Sunday morning it turned into a bright sunny morning if a little chilly and there were seven new Spartan personal bests; four Spartans were running their first half marathon; and a total of eighteen Spartans beat the two hour barrier. CALLUM STEWART was third out of the 1,380 finishers in a fast 1 hour 13 minutes 29 seconds while SIMON JACKSON was second Spartan and 18th overall in 1:18:23. There was a bit of a breeze going out on the figure of eight course but if you got to the top of the hill in Abbotsley for the second time at about 9.5 miles it was a great downhill, tailwind run almost all the way to the finish. Many of the new personal bests were on already good times – STUART ARCHER by one minute to 1:28:42; CHRIS HOLLAND by eight seconds to 1:39:10; KERSTIN WEINER by a substantial 3:55 to 1:48:13; KAREN ELLIS by 2:39 to 1:49:09; LIZ SMITH a massive 5.28 off to 1:52:20; CAROLE SHELDRICK 2:31 to 1:55:56 and CATHY CRAIG 3:05 to 2:11:58. JULIE SHADBOLT equalled her PB with 1:58:48. The first timers were TANYA BRAZIER 1:50:02; ZOE JACKSON 1:54:47; LIZ CARVELL 2:12:49 and TONI NICHOLS 2:27:13. CAROLINE CROFT said there were perfect running conditions but it wasn’t “Mr Whippy weather” after finishing in 2:15:25. MARIE COLUCCI said she was struggling but was the first Spartan woman in 1:44:22. The Henlow 10 is a unique event and it was revived on Thursday. It’s a point to point ten mile race from the Shuttleworth Collection airfield at Old Warden to the base at RAF Henlow. Incorporating the RAF championships civilians also take part. ANDREW PATTERSON was sixth of the 125 finishers in 58:53 with STEFFAN FORD 11th in 1:01:12 and RICHARD SPRINGALL 23rd in 1:06:42. RICHARD COWLISHAW got a half marathon personal best in a mud run! On Saturday he competed in the Leighton Buzzard Mud Run and finished in 1 hour 41 minutes 56 seconds. The race was cross country along a canal path and through woodlands in a lovely sunny fresh conditions, so he was pleased with his result. TIM SABAN said the event was nowhere near as hilly as some people make out. He finished in 1:34:49. It was a lovely autumnal morning to be out. Others at Knebworth were DAVID ACKERY in a new PB of 2:22:30; KELLY EVANS in 2:02:49; JONATHAN JONES 2:09:11; and SAM SIMMONS in a new PB of 2:00:58. Spartan YUKO GORDON won women’s 65 plus race in the 31st Irish and GB Masters cross country championships in Singleton Park, Swansea , Wales. She covered the six kilometres in 27 minutes 34 seconds. Mike Newbit came in at 7 hours 37 minutes. Sharon and Mike Crowley were happy to finish in daylight with 8 hours 24 minutes. Spartans ran at six different parkrun locations this weekend with two achieving new PBs. 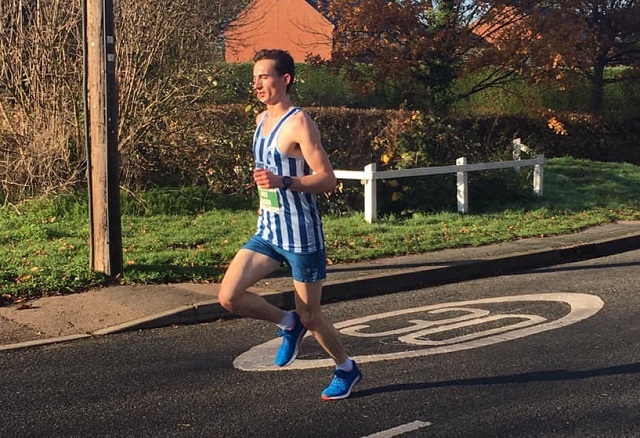 John HOLMES ran Stevenage in 21:03 and Nicola HATHERLY ran Ellenbrook Fields in a new personal best time of 31:44. Top gender positions went to Danny SCANLON 7th in Stevenage 19:54 and Kelly McHALE 10th in Panshanger in 25:10. Other top finishers at Stevenage included Alison SHELLEY 15th in 26:47, John HOLMES 17th in 21:03, Verity FISHER 18th in 27:54 and Monica SMTHSON 20th in 28:09. Position First Name Last Name Gun Chip Comments Impr.